You probably know by now I don’t like reading manuals until I absolutely have to. I’d rather jump in and get a beat going. This is exactly what I did with the Arturia DrumBrute. Out of the box, I was surprised by the light weight for something that appears to be bulky in photos. Other Arturia products, MiniBrute and KeyStep Pro, have some weight to them. The appearance of the DrumeBrute is beautiful with the gray case and wood side panels. The drum pads have a good feel to them similar to the Arturia Keystep products. The knobs look like those found on the Arturia MiniBrute but seem sturdier. The button and knob layout is good although some might look for faders for the drum parts. Each drum part has a knob for levels. Above the drum parts, we have the step sequencer, transport control and effects to the top right. Unlike the Roland TR-8, there are separate pads for the step sequencer and performance pads. The rear panel has MIDI in and out and clock in and out. Arturia has added individual outs for each drum part. There is a single mix output. Surprisingly, there are 3.5 and 1/4 headphone jacks. The headphone level knob is located in the rear. I would’ve preferred to see a MIDI thru port for greater flexibility. I’m happy to report that manipulation of the drum part is significant and keeping sound quality good. I’ve experience other gear where changing manipulating the sound leads to poor sound quality or negligible change all together. Although the sound was more than acceptable, I’m immediately thinking of adding a compressor to thicken the sound. 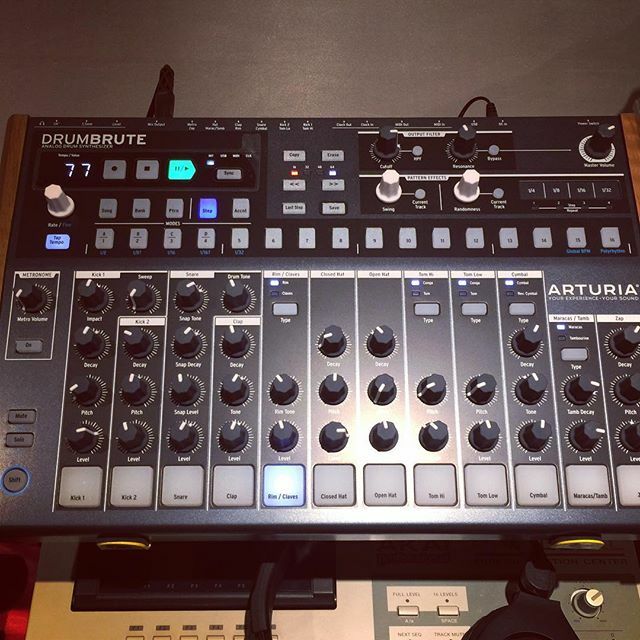 The DrumBrute was introduced at an MSRP of $449 but now has been raised to $499. Analog gear is making a strong comeback at reasonable prices. Overall, the DrumeBrute is going to give the Roland TR-8 a run for its money and can be a mainstay in any studio. This entry was posted in Arturia, Drum Machine, Music Gear Talk on January 3, 2017 by Eric PM. Sometimes, I’m asked why do I have a DJ mixer with my computerless music production setup. I was asking the same thing when I started watching Saytek Live on YouTube. DJ mixers add a certain functions for extra creativity. I’ve had different audio mixers in the past but I was always missing the cue feature. DJ mixers allow you to cue the next track. You can hear a different channel without interfering with what is playing live. When improvising during a performance, you can prepare a new bass line or drum sequence on the fly while you’re playing an existing track. When you are ready, bring in the new track via cross-fader or channel fader. The other reason I love using a DJ mixer in my setup is that the faders are loose and quick to move. Typical audio mixers have faders slow to change. I couldn’t quickly kill a sound on my Behringer mixers and it’s something you really don’t try to do on a mixing board. DJ mixers are for performance. Just watch any popular scratch DJ video to see how they use every fader fluidly. I picked up the Pioneer DJM-600 used for $200 at Sam Ash. I always wanted something from Pioneer DJ. I thought I was fine with my Numark M6 but the inability to incorporate FX bothered me plus the only performance fader was the cross-fader. The Pioneer DJM-600 has a few typical FX built-in but also has a FX send/return. After seeing this feature, I had to get it. The FX send/return allows me to use external gear for FX like a Korg Kaoss pad. The other cool feature of the DJM-600 is the built-in sampler looper. 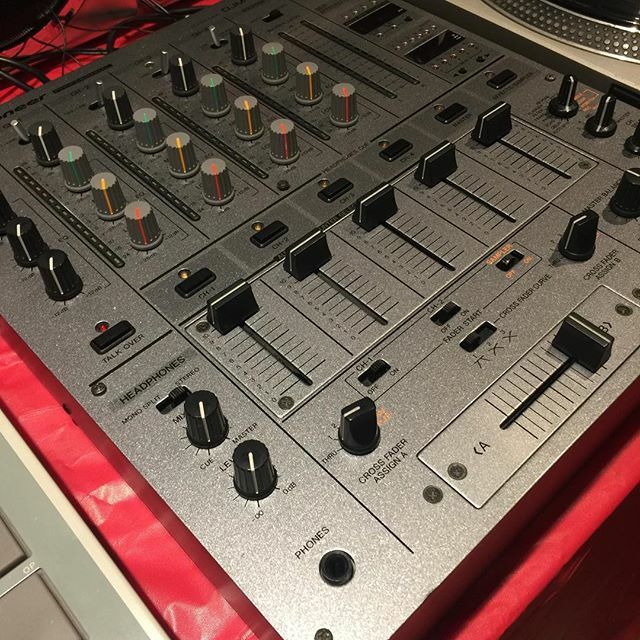 The Pioneer DJM-600 although 11 years old is built like tank. After cleaning it up, I’m happy to say everything works. So next time you pass a well priced used DJ mixer, know it doesn’t have to only be for DJ’ing. This entry was posted in Music Gear Talk, Pioneer on January 3, 2017 by Eric PM. Used Akai MPC 3000LE at Guitar Center, Pasadena! It’s not often Guitar Center gets a classic Akai MPC anymore. I regret passing so many of them up before I learned to appreciate stand alone music gear. Guitar Center prices most used items pretty fairly and occasionally you will find a bargain. 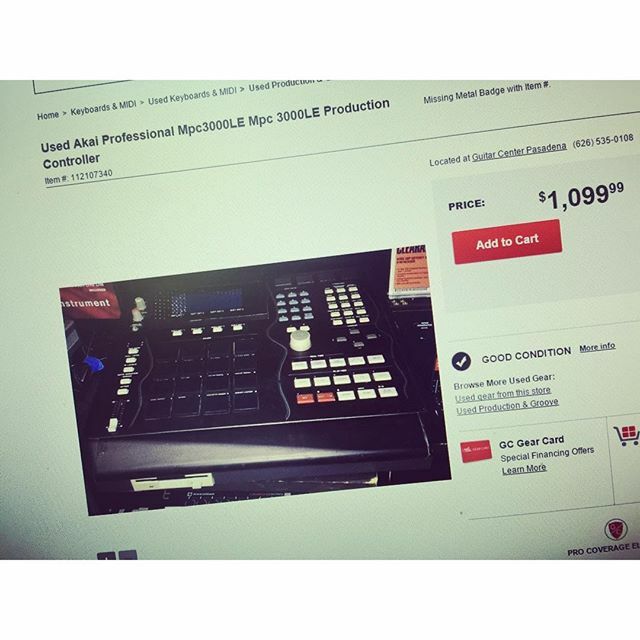 $1099 is pretty fair for the MPC 3000LE. The 3000LE sells very high on Ebay although the only difference with the LE and the non-LE is the black case. Some claim the plastic on the LE buttons are sub-par to the original MPC 3000. Unfortunately, this Akai MPC 3000LE was sold a few hours I discovered it online. Congrats to whoever scooped it up. This entry was posted in Akai Pro, Music Gear Talk, Samplers and tagged 3000LE, Akai Pro, Samplers on June 7, 2016 by Eric PM. Watch the video above for a general overview and demonstration of Arturia Keystep features. Can not record live playing. You must program the sequence first. 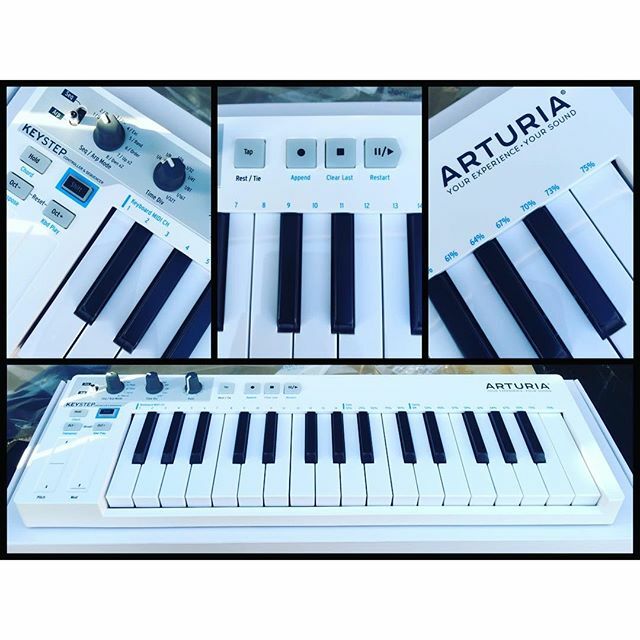 This entry was posted in Article, Arturia, Music Gear Talk and tagged arturia, keyboard, keystep, midi, sequencer on June 4, 2016 by Eric PM. I bought the Novation Launch Control XL to use with Ableton Live. It was boxed up quickly after getting better at using the Ableton Push. Novation then released a firmware update and video demonstrating it can be used without a computer. Unfortunately, the accessory needed to make this happen is some what costly. The most popular USB to MIDI adapters for this set up is the iConnectMIDI4 and the Kenton USB MIDI Host. They keyword here is ‘host’. Some make the mistake of getting simple USB to MIDI adapter and discover they do not work. It has to be a MIDI host device. I chose the iConnectMIDI4 since I had a 20% off coupon at Guitar Center to reduce the price. I also bought it due to the feature of audio over USB. With the growing popularity of synthesizer apps for IOS devices, I have the option of utilizing the iConnectMIDI4 between my iPad and DAW. The device also has several DIN MIDI ports and USB ports for complex routing setups. My first attempt was to use the Launch Control XL (LCXL) with the Novation Circuit. Using Windows 10, I had a problem loading the custom mappings from Novation into the LCXL. It turns out Novation is aware of the problem. I was able to load the mappings using my Macbook Pro instead. Without needing to use the iConnectMIDI4 software, the devices started working together right away. Like the Circuit, I also have to remember what all the knobs do on the LCXL since there are no labels. The Launch Control XL became a true extension to the Circuit. The usage became somewhat unconfined with parameters accessible. I look forward to discovering what other devices in my stable can be used with the Launch Control XL. The Launch Control XL and the iConnectMIDI4 combined nears $350 in just accessories. Find your own justification because $350 is a hard pill to swallow for me. 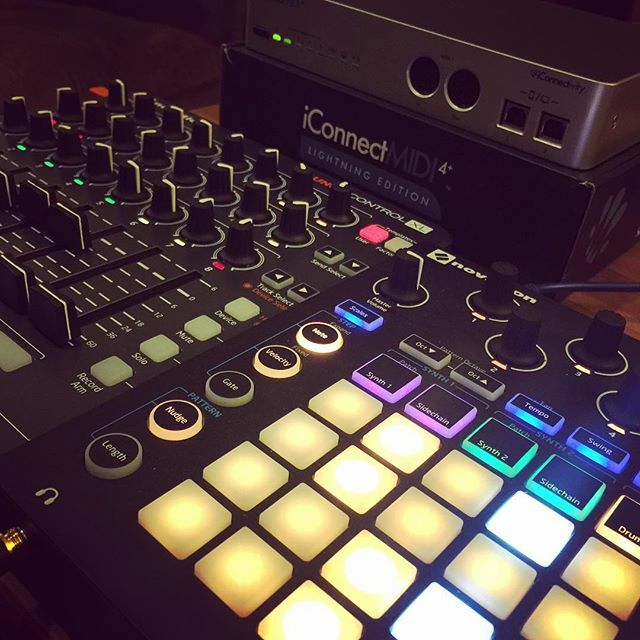 This entry was posted in Music Gear Talk, Novation on May 6, 2016 by Eric PM.